On this page you will find all of our latest news and offers - This page is updated regularly - each post is dated. - Please don't hesitate to Contact Us if you would like any more information. 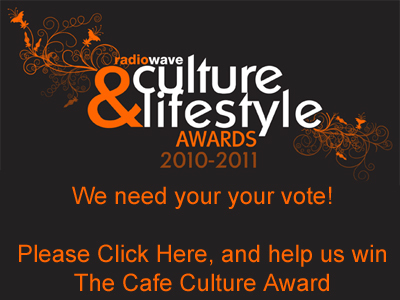 Thanks to all you guys nominating, Elegance was lucky enough to be nominated for the 'Cafe Culture' Award. We need your help again! We are in the final 3 and now need your votes to help us win this award. Please vote for us by clicking on the link below. Come in out of the cold on your shopping trip and get a complimentary piece of cake when you buy ANY hot drink! 5 Years ago on Monday 19th December 2005, Elegance of Blackpool opened it's doors for the very first time. Since then, we've Baked and Beautifully Hand Decorated hundreds of cakes for Weddings, Birthdays, Christenings, Christmas, in fact, just about every occasion you can think of! We've served thousands of cups of Italian Style Coffee and Cake to tired shoppers, and Blackpool visitors! We couldn't have done it without the support of ALL of our customers! - To say thank you, we would like to offer a little something back! Christmas is coming and now is the perfect time to be thinking about booking your Christmas Parties, Lunches and Ordering Christmas Cakes and Desserts. 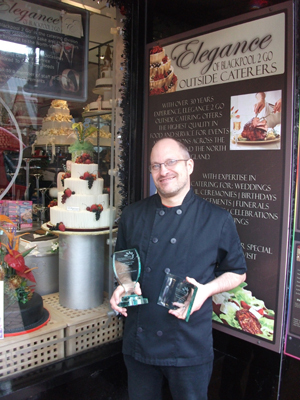 "We're very proud to have achieved such an award - 'Best Business in Blackpool Town Centre', and with Elegance's 5th Birthday just around the corner, it couldn't have come at a better time!" Here at Elegance we have decided it's time for a change, so, here it is, brand new website. We've re-designed everything to try and make it easier for you to find what you want! We have also launched a Facebook page where you can keep up to date with what we're doing, including seeing all of our cake creations as we do them!